Asteroid Bennu is an enormous space rock of particular interest to NASA. As an ancient relic of our solar system’s early days, NASA believes Bennu could be key to unravelling the universe’s origins. But Bennu has now revealed more than anyone had anticipated, with the latest high-definition photos showing evidence of alien technology, a prominent UFO proponent claims. 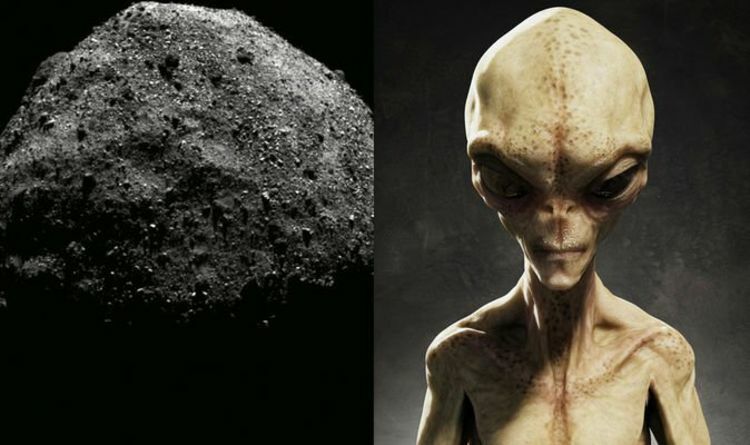 UFO hunter Scott C Waring believes NASA selected to study Asteroid Bennu because it offered an opportunity to contact aliens. Mr Waring wrote on his ufosightingsdaily blog: “Have you ever wondered how NASA chose to explore a certain asteroid in space? The ancient asteroid is currently hurtling through the vast void of space approximately 70 million miles (110km) from Earth. Yet despite the enormous distances involved, NASA has released the best-ever batch of Bennu photos. The pictures were taken by NASA’S OSIRIS-REX spacecraft as it orbited Bennu. And Scott Waring believes various evidence of alien technology is visible, after significantly zooming-in on the images. He wrote: “These structures are on Asteroid Bennu and show buildings, towers, pyramids and even some abandoned ships. “All of which look a bit beaten up since they have probably been abandoned on this asteroid for millions of years. And the UFO hunter believes NASA has been covering-up this knowledge of intelligent extraterrestrial beings. Mr Waring wrote: “The asteroid is littered with rocks, however some of those black or silver objects are more interesting than NASA wants you to know. “I am reporting only what I found in one of 31 photos within that gif. The NASA OSIRIS-REx space probe will attempt to collect a surface sample from Bennu by 2023. Ahead of the daring rock collection mission, NASA’s spacecraft dips in and out of orbit around Bennu to take detailed snapshots of its surface. The latest Asteroid Bennu pictures were taken by the spacecraft’s MapCam camera on February 25, 2019. The asteroid pictures include a wide shot and two close-ups of a region in Asteroid Bennu’s Northern Hemisphere.